From Maastricht via Ljubljana, Brussels, Constance and Vienna, 33-year-old Eva from Cologne has now returned to the very neighbourhood she grew up in. The married mother of a daughter lives in a modern, 90 square metre apartment. Discover a few of the creative living ideas she's used to furnish her family home Scandinavian style. 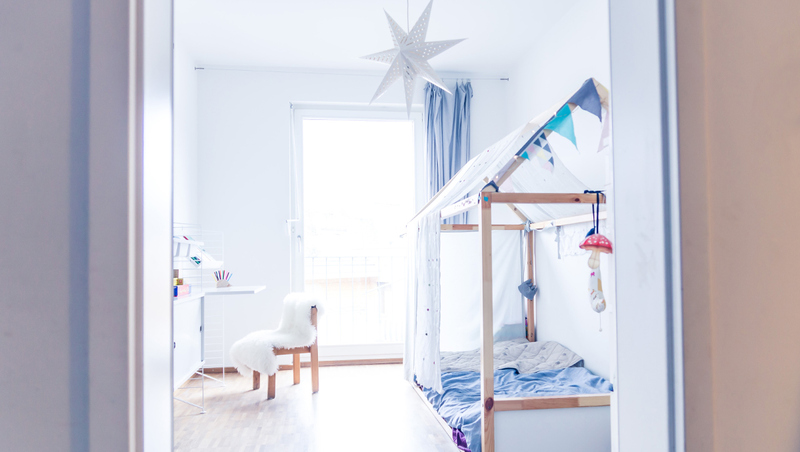 Functional, minimalistic, and with loving attention to detail: Eva and her small family have been living in an open-plan, 3-bedroom apartment in the southern “Südstadt” district of Cologne for the past two years, surrounded by Scandinavian designer furniture. These include a dining table by Hay, a lamp by Bolia, and the popular string® wall system. 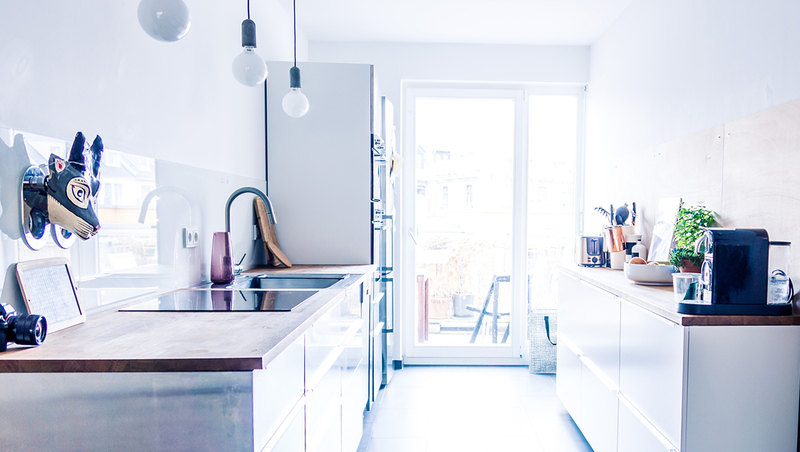 With Eva’s husband being Swedish, the couple’s obvious preference for Scandinavian furnishing is hardly surprising: The creative couple with love for the northern kind of minimalism opened up their apartment exclusively to G-Pulse. 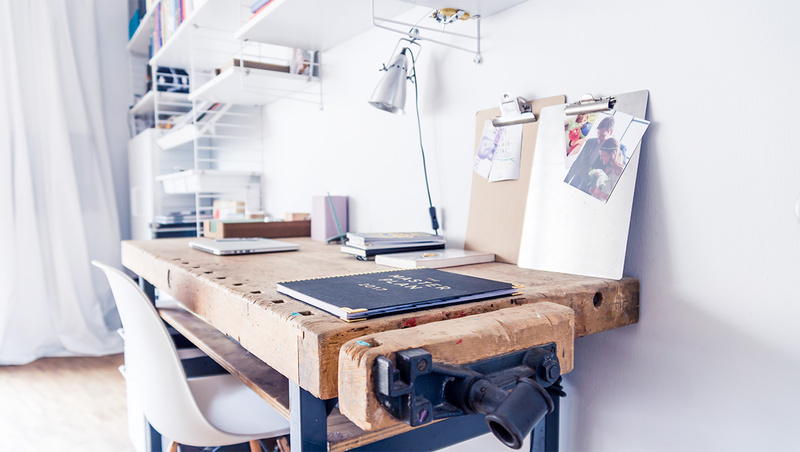 Anyone casting an eye around Eva's living room can't help but admire her old workbench. It's a really special piece, bursting with charm, and used by the family not only for work, but also for Eva's daughter to have fun with handicrafts. No wonder that it's one of Eva's favourite pieces. To find out more about Eva's style of living, we asked her a few questions about her home furnishings. G-Pulse editorial team: Eva, how would you describe your style of living and who is your role model? Eva: I've furnished my home according to the principle "less is more". Nearly all the furniture we have is practical. It's only in our daughter's room that we've found this a bit trickier to apply, and have gone for a more playful approach there. I've definitely been influenced by my family's style of furnishing – even if that's something I don't like admitting. My mother and sister both have excellent taste and go for a casual, rather than perfectionist interior style – and I'm very happy to pick up tips from them in that respect. G-Pulse editorial team: Which piece of furniture in your apartment are you most particularly fond of? Eva: Our writing desk, which is actually an old school workbench. I like its rugged look, with all the scratches and quirks. It contrasts particularly well with the cool, white string® shelving. And the clamping screw on the side of the bench is actually very practical – we can even crack nuts with it! But Eva also loves her big, round Hay dining table: "It's the focal point of our apartment. It's got plenty of space for visitors, but even when it's just the three of us, we love the size of the table. The apartment is divided into three bedrooms, with an open-plan kitchen, bathroom, guest bathroom and two balconies, offering the family plenty of room to flourish in the middle of the lively Südstadt district of Cologne. On the opposite side of the apartment, there is another white string® shelving unit, just like in the living room. Eva has come up with something special here. Incorporated into the shelf is a height-adjustable tabletop, which can be continuously adjusted to Emma’s height. G-Pulse editorial team: Eva, what do you have planned next for your apartment? Eva: Actually, we'd like to give our daughter's room a facelift. We're thinking of painting one of the walls to add some colour, but we're not sure which colour that will be yet. We could imagine a light grey, but pink isn't entirely off the list either. One more wish: light switches in matching colour schemes and socket outlets with orientation lights. We think that's a great idea. Particularly if – as in our case – you have a child who gets nervous in dark hallways." Until now, all the walls in Eva's apartment and nearly all the switches and socket outlets have been left completely white. If Eva actually wants to convert her existing Gira E2 switches, that won't be a problem. 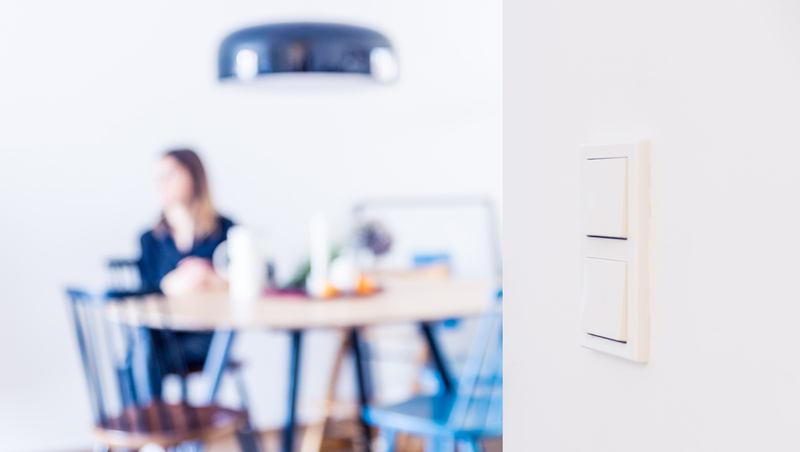 The family can use the Gira Design Configurator to put together the exact set of switches they need to match their decor perfectly. Eva's apartment is a brilliant example of how to furnish your home in a practical, stylish, and cosy way using a mix of Scandinavian design classics, vintage furniture pieces, and decorative accessories. What do you think about transforming your home like this? Did you pick up any living ideas for your own home?